A HAMPSHIRE business has played a part in the completion of HMS Daring, the first of The Royal Navy's fleet of Type 45 Destroyers that is currently based in Portsmouth. 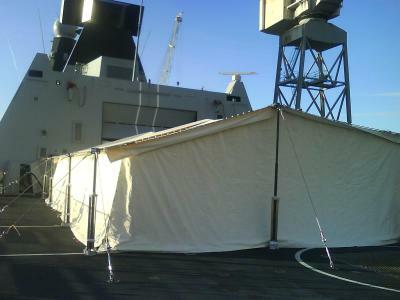 Custom Covers (1984) Ltd designed, manufactured and supplied a ceremonial awning for the ship, which hundreds of people greeted as she moored in Portsmouth recently. The award-winning Hampshire marquee manufacturer was awarded the contract to work on the ship - hailed by its creators as the most powerful and advanced vessel of its time - because of its specialist skills for industrial covers. It is a big accolade for Custom Covers as the Type 45 destroyers will be the flagships of The Royal Navy fleet and will provide the backbone of the UK's naval air defences for much of the next 50 years. The company, based in Southampton, was also commissioned to design, manufacture and supply awnings for the other five ships in Daring's fleet. Daring will be based in Portsmouth until the end of the year and will be stationed in the city when not on active duty. Simon Bell, Custom Covers' Technical and Production Director said the whole company was extremely proud to have been a part of the prestigious project. He added: "We pride ourselves on being the experts in the field of temporary structures and we are delighted to demonstrate our ability to apply the traditional skills of our highly skilled workforce to this most modern of projects." A team of 30 worked on the project from concept to completion, working around strict Royal Navy guidelines and requirements, making sure that existing fittings were used to attach the awning to the flight deck. And, although its dimensions (12.5 metres by 20 metres) create a large space on-deck, stowing the material, along with its high-tension wires and aluminium posts, had to be very space-efficient, using the minimum volume of space. 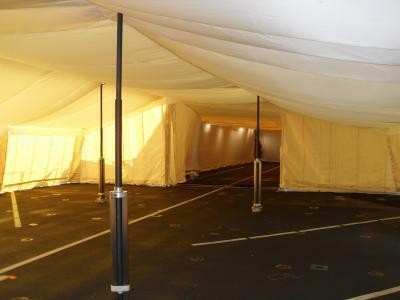 In addition to its function as a ceremonial awning, the Navy also wanted to be able to use the helicopter hangar as an extension to the space, so Custom Covers had to design an extra transition piece to join to the 6.5 metre by 14 metre hanger to go between the ship and the awning.